Creative launched its first made for iPod accessory Xdock in Singapore! On 11 April 2007, in a concerted effort to bring X-Fi technology to the home, Creative is in collaboration with property developers such as Far East Organisation to work towards this initiative. 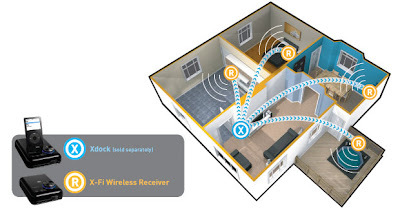 "We are pleased to have Creative launch their X-Fi solutions for the home at the Icon Condominium. This technology fits the trend setter lifestyle of our Icon. As we were impressed with this technology, we have decided to outfit 195 apartments in the Orchard Scotts Residences with Creative Xmods to create the X-Fi experience for our guests," said Chia Boon Kuah, Chief Operating Officer, Property Sales, Far East Organization. From May to July 2007, the first 8 buyers of the elegantly designed La Casa Executive Condominium will be able to X-Fi their homes with Creative X-Fi solutions, compliments of Creative. As part of the collection, the 2 new iPod docking products, the Creative Xdock and Creative X-Fi Sound System i600, are set to tap the full potential of iPod by bringing the X-Fi experience to iPod users. Together with other audio products, users are able to transform the iPod into an entertainment centre for their home with Creative's Audio Essentials for iPod. Wow, we are totally excited! This is a good move to collaborate with a local Singapore property developer to fit all the 195 Condo apartments with X-Fi solutions including the Creative's first iPod accessory Xdock! The launching of Xdock was first announced in Singapore even earlier than America. This is definitely a way to let consumers experience the X-Fi technology. Imagine all the 195 apartments Internet users can also experience this X-Fi technology that breathes life into your songs, restores the detail and expands your music and movies to surround sound, making your music way better by accessing http://www.x-fi.com/whatis. Get more details here! Creative launched its first made for iPod accessory Xdock in Singapore! I LOVE my Creative MP3 Player and I highly recommend them! Cheers from Toronto!